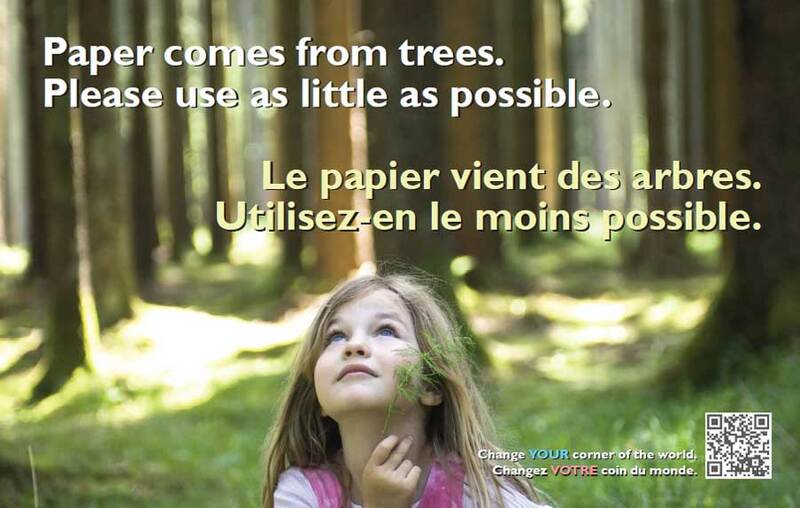 Reduce your paper towel costs quickly and easily! Paper towels are a feature of public washrooms everywhere. And because they are dispensed for free, most visitors use two, three or even four pieces - without pausing to think that one piece is enough, or to think about trees or trash. to view a larger web-res image. Actual product is 8" x 5". So the cost of paper towels adds up. And so does the cost of disposing of used towels. Here's a quick, easy and inexpensive solution: an attractive, full-colour sticker to gently invite your visitors to use only the paper they really need. Most people want to do the right thing. Now you can help them – and benefit from instant savings! *Canadian orders are subject to applicable taxes (GST or HST). 20% of all sticker profits will be donated to The Nature Trust of New Brunswick, to support the preservation of special natural places. Looking to order? Or are you interested in a free sample? Contact Carl. Interested in different languages? Please contact Carl. Comments or inquiries? Please contact Carl.